Rumber® is strong and highly durable with unlimited potential uses. Rumber® is the environmentally-friendly material, a natural choice for a number of specialized products. As one of the most important trailer elements, flooring has to be exceptionally strong and durable enough to last for years without cracking, warping or rotting. Ideally, the flooring would be easy to clean and able to withstand drastic temperature changes. Rumber® is the solution. It serves as a cushioning surface for livestock, giving them a firmer footing and minimizing the risk of injury. In addition, Rumber’s cushioned texture reduces the physiologic stress on joints and soft tissue, noticeably reducing the fatigue associated with transport. 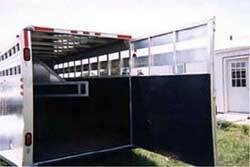 Rumber® Boards are impervious to water and have a limited 20-year warranty for horse and livestock trailer applications. With unprecedented durability and attributes that clearly out-perform traditional materials, Rumber® increases the value and life of the trailer.The result is less downtime, fewer replacement costs and extended life for stock trailers. Rumber’s unique traction-surface can reduce the risk of livestock injuries, helping ranchers avoid a troubling and expensive cost of business. 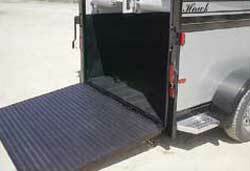 Please note that an existing trailer cannot be retrofitted for Rumber® flooring. The Rumber® boards are much thicker than a wood or aluminum floor board and would require significant modifications to support.